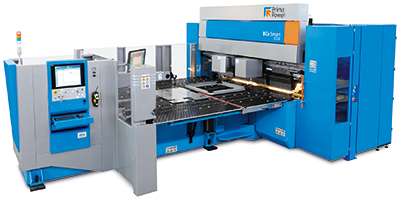 Prima Power North America’s new BCe Smart 2220 panel-bending machine features a large working table that allows loading and unloading in a single sequence, to optimize productivity. A barcode reader and automatic tool-change system simplifies and automates setup and activates dynamic production queues. Among machine features that promote ergonomics and safety: the the absence of physical barriers for manual loading; warning lights; acoustic signals to synchronize loading and unloading; and programmable luminous reference for to assist in positioning the pieces to be machined. The worktable side sections easily can be lowered to allow the operator closer access. Use the BCe Smart for producing small volumes, kits of components, and individual parts with high-quality bending and high repeatability. Maximum bending length: 2250 mm; maximum sheet size, 1500 by 2850 mm. Bending force: 32 tons.